Sea Salt & Pepper Peanuts ("blistered" and seasoned with fine Sea Salt and fresh cracked Black Pepper) and Honey Roasted Peanuts (cooked with light amber honey, sugar and salt) combined with red and white chocolate gems. Deliciously appropriate for gifts, holiday parties and snacking. Vacuum-sealed in our 20 oz. 85th Anniversary Celebration tin for maximum freshness. Oil Roasted Peanuts, Salt and Pepper Seasoning (Salt, Pepper, Dextrose, Maltodextrin, Xanthan Gum and Silicon Dioxide) 2% Max to Prevent Caking), and Peanut Oil. Honey Roasted Peanuts: Sugar, Light Amber Honey, Peanut Oil, Potato Starch, Salt, and Xanthan Gum. Milk Chocolate Gems [Sugar, Cocoa Butter, Chocolate Liquor, Whole Milk Powder, Lactose, Soy Lecithin, Salt, Vanillin (An Artificial Flavor)], Sugar, Artificial Coloring (Includes Red 40 Lake), Titanium Dioxide (Color), Gum Arabic, Corn Syrup, Confectioner's Glaze. Manufactured on Equipment that also Processes Peanuts, Tree Nuts, Soybean, Wheat and Milk Products. Contains: Peanuts, Milk and Soy. We love this mix of sweet and salty, nuts and chocolate. Perfect snack. We love this stuff! Our friends think it's great, too! I only wish that it came in a larger size tin. Thank You! My brother in-law cannot get enough of your Celebration mix. Thanks for making the perfect gift! I have fallen in love with this mix. The sweet along with the peppery, and some chocolate bits thrown in - perfect! I am a repeat customer of Virginia Diner. Great products. Great service. 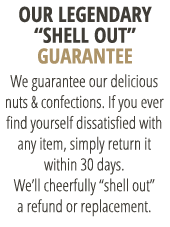 Loved the celebration nut mix. Hope to visit this location soon. We love the celebration mix. Salty and sweet. Never fails to exceed my expectations! This mixture isn't one of my favorites. While I love the sweet/salty combo, the black pepper is too overpowering. And it coats the other nuts and candies, making them super peppery also. Will finish it, but won't buy again.